The first step in developing your invention into an innovative consumer product. The following video shows you how to take the first step in developing your invention. If you prefer, click the link below to read the transcript! 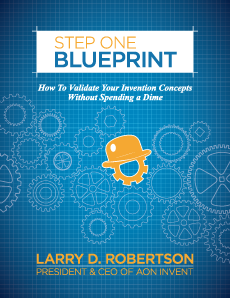 Then check out our FREE step 1 innovation guide. Click here for the transcript, How does AON Invent helps inventors? Congratulations! By watching this video you are taking your first step in developing your invention. From my experience, most people have an idea for a product that they believe should be in the stores. But the sad fact is that most of those ideas, rather than ending up on the shelves, end up going to the grave with their inventor. Sure, you could invest your savings to develop your product and hope that the world would line up at your doorstep to buy your product. But that could be very risky. Design, patent production, and tooling alone could easily cost hundred of thousands of dollars before producing the first production-selling unit. And even then you have no guarantee that your product will sell. Every year thousands of American inventors discover this way too late and end up with a very expensive paperweight sitting on their mantle after hiring an invention service company that told them what they wanted to hear instead of telling them what they needed to know. Who are we? We are AON Invent, a full-service invention superhighway, built by a committed team of industry professionals who are dedicated to providing our inventor customers with everything they need to go from napkin-sketch to the sales presentation of a major consumer products company. This is the power of the AON Invent model. Situated in the center of the retail world where we interact daily with companies that are crying out for new, innovative product concepts. For years our sister company, All Product Design, has been aiding consumer goods companies with product development and innovation, as well as helping inventors. After designing a product for an inventor, APD will try to connect the inventor with one of the many companies in the region that constantly strive for innovation in their lineup. Building on this model, our vision was to level the playing field so that anyone with a new product concept could have their idea professionally vetted at minimal expense and then present commercially viable concepts to companies that are both supplying related products to retail and also continually searching for new items to reinvigorate the merchandise assortment. So here’s how we do it. Step 1 – Here we want you to read through our website, and then do your own search based on our own recommendations and those of the US patent office. This part is totally free, so please be very thorough. When you are satisfied that your product is unique as best as you can assess and viable for the market, we will have you sign a non-disclosure form so we’re all protected and then have you schedule your initial consultation with one of our consumer product experts. At Step 2, we capitalize on our location and ready access to highly accomplished individuals who have collectively taken literally thousands of new products to market. The goal in Step 2 is to make sure we understand your invention and then rate its commercial potential on our star scale of 1 to 3 to help you determine whether or not your idea merits further time and investment. Three star product ideas will be eligible to move on to Step 3. Here we will conduct a thorough prior and patent search, file a provisional patent application, and create a presentation that accurately and effectively communicates the form, function, and value or your invention. Your product is then run by our panel of experts, a hand-picked group with a variety of real world experience and a long history of success in consumer goods. Our panel will analyze your idea on the basis of design complexity, manufacturing requirements and costs, marketability, demographic, and a slew of other criteria to assess the overall viability of your idea and supply you with a full report of this board’s findings. If all goes will in Step 3, your item is placed into AON Invent’s innovation silo where it can be viewed by product vendors who have secure access that will allow them to view presentation, reports, developmental cost, and licensing information for your invention. Will we get your product sold? We can not promise you that. Statistically, getting a product to market is tough. But I will say this: AON Invent’s model has been designed to be a win for every party involved. We have created a system to minimize the inventor’s investment and dissuade products that are likely to fail as early as possible. And finally we strive to get credible products into the hands of companies that are actively seeking innovation. This is where inventions come to be sold, and we guarantee an honest service and a team that is committed to taking innovation to the shelves of American retailers. Please contact us today for honesty, integrity, and a crew that is on your side every step of the way. If you like the idea of knowing up front exactly what it will cost to see if consumer product companies are willing to take your invention to market, then you have come to the right place. We are AON Invent—the inventor’s best friend and an invaluable resource to the American Consumer Products Industry.